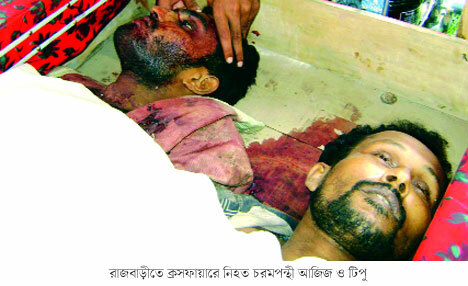 Extra Judicial Killing: More two killed in Rajbari ‘encounter’! More two killed in Rajbari ‘encounter’! It is just a number that's rising! Fifty-three people have so far been killed since the High Court on December 14, 2009 asked the authorities not to kill any more people in ‘crossfire’ or ‘encounter’ until it hears a rule it issued suo moto on the government in connection with extrajudicial killings. The deceased were Mohammad Abdul Aziz, 38, and Dipu Kumar Das, were regional leaders of Purba Banglar Communist Party (Red Flag). A Rapid Action Battalion team raided Bhatshala about 3:45am on information that gangsters were engaged in a gunfight at the place. Abdullah Al Mahmud, senior assistant superintendent of RAB 8, said as the team reached the place, the gangsters the fired into the team. The lawmen fired back, Mahmud said. When the outfit operatives got away after about 30 minutes, the lawmen found Aziz and Dipu lying dead. The battalion official said they had seized a shooter gun, a light gun and 10 bullets from the place.